Offer only available to 20 people per day! ACTIVATE FRESHER BREATH: Refreshing Minty Taste, Long Lasting All Day Freshness. Helps Neutralise Bad Breath Bacteria. 100% NATURALLY DERIVED INGREDIENTS: Our Advanced Formula Contains Naturally Derived Ingredients To Help Provide All Day Protection From Toxins and Stains. SAFE ON ENAMEL AND FLOURIDE FREE: Suitable for Vegans and Vegetarian Friendly. 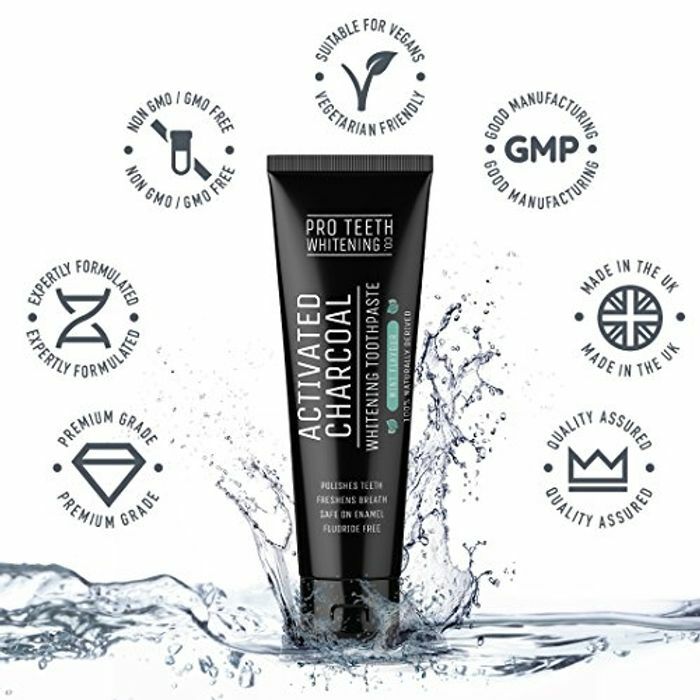 Low in Abrasion, Activated Charcoal Helps Remove Stains From the Surface of Your Teeth, Without Harming The Enamel. MADE IN THE UK: Our Products are Manufactured in the UK and Adhere to the Good Food Manufacturing (GMP) Production Standards to ensure Consistently High Quality. What do you think of this Amzpromoter deal? Is this any good. I've not tried it be for. Thank you jameswalters for sharing a great deal. Excellent toothpaste. Never seen pro teeth whitening in the shops except in Boots. It's not cheap.